French chef Paul Bocuse receives applause from students at the Culinary Institute of America on February 15, 2013 in Hyde Park, New York. Bocuse got a rapturous welcome in the United States for the inauguration of a new restaurant bringing his culinary prowess to American palate. Iconic French chef Paul Bocuse got a rapturous welcome this weekend in the United States for the inauguration of a new restaurant bringing his culinary prowess to American palates.Despite a bout of ill health last month, the 87-year-old chef, among the most accomplished in history, did not hesitate to cross the Atlantic for the launch of The Bocuse Restaurant. The Culinary Institute of America last year closed its Escoffier Restaurant, named after “the king of chefs and the chef of kings” Auguste Escoffier. After renovations, the menu was revamped to feature contemporary French fare after some of Bocuse’s best recipes at CIA’s first new restaurant in 40 years. Escoffier had helped make haute cuisine available to family kitchens thanks to cookbooks and restaurants at the Ritz in Paris, London’s Savoy and other distinguished institutions. At the CIA’s campus on the banks of the frozen Hudson River, hundreds of students attended Bocuse’s lecture on Friday to hear him speak about his life and dole out both advice and encouragement. 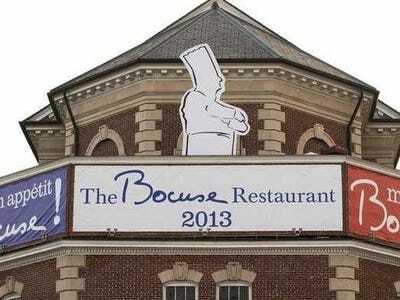 Signs welcome chef Paul Bocuse to the Culinary Institute of America February 15, 2013 in Hyde Park, New York. Bocuse, who turned 87 on February 11, 2013, was on hand as the institute opened the Bocuse Restaurant in honour of the famous French chef. Donning as always his chef’s hat and apron, he was surrounded by several of the biggest names in French cuisine in New York — Jean-Georges Vongerichten, Daniel Boulud and Thomas Keller — and his son Jerome.They paid tribute before a packed audience to the storied chef during a talk on the future of French cuisine. In honour of his birthday on Monday, the students had prepared a gigantic cake of five layers with a big “B” on top as a surprise. Nearly a thousand people then launched into a happy birthday song, in both French and English. 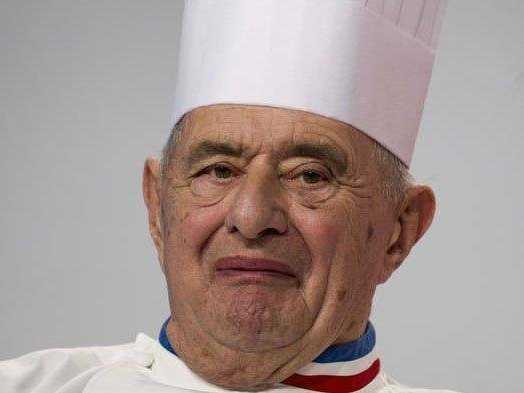 Bocuse, a three-star Michelin chief since 1965 who the CIA named Chef of the Century in 2011, then autographed cookbooks and posters celebrating his restaurant’s opening. In the evening, he officially inaugurated the restaurant by breaking a replica of a very large soup tureen like that used for his famous black truffle soup VGE created in 1975 in honour of former president Valery Giscard d’Estaing. “Paul Bocuse is simply stated, the most important chef in history,” said CIA president Tim Ryan. About a hundred guests — many of whom had earlier posed to snap up photographs with Bocuse — savoured a dinner that mobilized the efforts of about 50 students in the kitchen and two dozen in the dining room. L’Assiette aux Trois Chocolats Gaston Lenôtre is one of the dishes served at the dedication dinner of the Bocuse Restaurant at the Culinary Institute of America February 15, 2013 in Hyde Park, New York. French chef Paul Bocuse was on hand as the institute opened the restaurant in his honour. 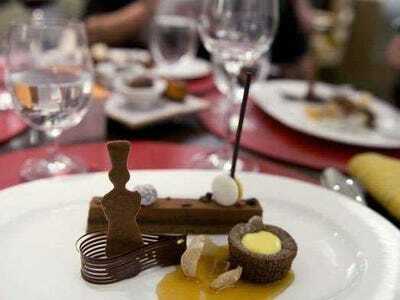 The menu included a peach of foie gras, lobster with champagne and caviar and filet mignon of beef with marrow custard. And for dessert, the guests were treated to grapefruit sorbet with vodka, a plate of three chocolates by pastry chef Gaston Lenotre and mini-pastries.”Mr Paul,” who arrived on Thursday from Europe, could not stay until servers cracked open the 1926 Armagnac wine. He had to travel to Florida with his son, who now heads up the Chefs de France restaurant at Walt Disney World’s Epcot theme park. But the French chef said he was delighted by his new restaurant and the honours he had received. The ageing chef now walks with difficulty, and revealed that he can’t hear very well, but those are small matters to him. Asked about his legacy, he preferred to speak about the future.